French government bond yields rose yesterday, pushing the gap over safer German peers to its widest since May, after more violent anti-government protests in France over the weekend. The turmoil in France comes as heightened global trade tensions, Brexit uncertainty and caution before this week’s European Central Bank meeting are bolstering demand for top-rated German debt. While higher-rated French bonds often benefit from risk aversion in world markets, turmoil in France prompted investors to stay away. The anti-government protests will slow growth to close to a standstill in the final quarter, the central bank said yesterday, complicating President Emmanuel Macron’s task of finding concessions to placate the ‘Yellow Vest’ movement. 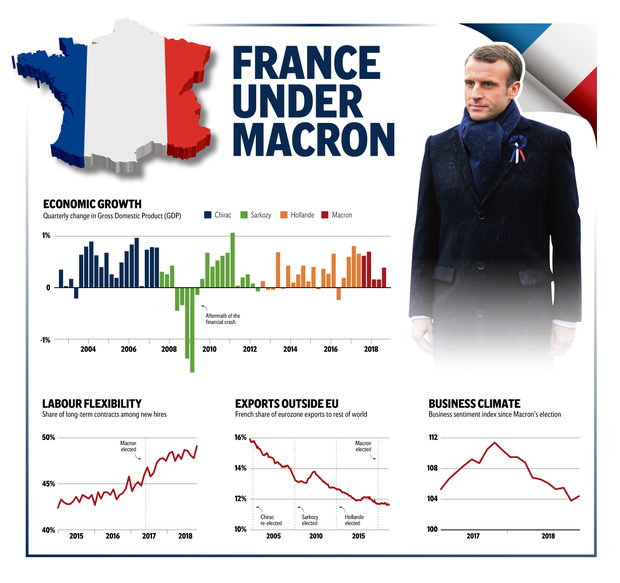 The Bank of France yesterday forecast the eurozone’s number two economy would eke out growth of only 0.2pc in the quarter from the previous three months, down from 0.4pc in a previous estimate. “Concern about a bit of political and fiscal capitulation is rarely good for a bond market,” said Chris Bailey, European strategist at international financial services firm Raymond James. French bond yields rose up to seven basis points on the day across the curve, with France standing out as the weakest-performing bond market in the bloc. The gap between 10-year bond yields in France and Germany widened to around 46 basis points, the biggest difference since late May, when a rout in Italian bonds rippled over into other eurozone bond markets except Germany. Mr Macron was due to make a televised address last night as he seeks to placate protesters, whose revolt poses his biggest challenge since assuming the presidency 18 months ago. “The big picture is that the budget deficit will worsen and political problems will make cuts to spending hard,” said Rabobank rates strategist Lyn Graham-Taylor. Political uncertainty also put upward pressure on Belgian yields. Prime Minister Charles Michel relaunched his government on Sunday as a minority administration after the biggest party in his coalition quit in a dispute over a United Nations migration compact.